Nupur's One hot Stove is one of the blogs that I love a lot. I love her simplified recipes. I have already tried pav bhaji from her blog and have been making it regularly now. This bhadang too is adapted from her blog. My family loves this a lot and I always have a container filled with delicious snack. When in mood for some quick snack in the evening I just add some chopped onions, chopped tomato, chopped coriander leaves and lemon juice as mentioned by Nupur. My little boy and my mother in law loves this snack a lot. I have copied the same recipe with my changes marked in red. 1.I powder salt and sugar in mixer in its smallest jar available. 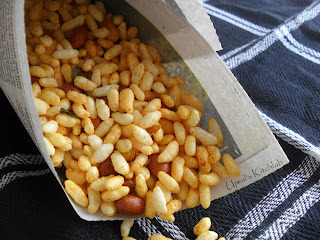 I prefer doing this because in he last step when we mix sugar and salt it coats the puffed rice nicely. Heat oil in a large pot. Add cumin and mustard seeds and let them pop. 2. Add peanuts, garlic, curry leaves and saute till the garlic is lightly browned. 3. Add salt, sugar, turmeric and chilli powder and saute for a few seconds. 4. Add the puffed rice and raisins and saute on low-medium heat, stirring often till all the puffed rice is coated. Turn off heat after 3-5 minutes. Thank you so much Nupur For this wonderful snack.